confidence as they become bilingual world learners and leaders. YCIS Silicon Valley is located in the vibrant community of Mountain View, CA. With two campuses in close proximity, YCIS is conveniently accessible from Highways 101, 85, 237 and the Central Expressway and close to many of Silicon Valley’s major employers. Grades K-8: 8:15 a.m. to 3:15 p.m., with after-school programs until 6:00 p.m.
Our confident, globally-minded graduates have attended top private and public secondary schools such as : The Harker School, Castilleja School, The Nueva School, Woodside Priory, Sacred Heart, ‘Iolani School, Hawaii Preparatory Academy, Valley Christian School, The King’s Academy, BASIS Independent, Summit Denali, Los Altos High School and Palo Alto High School. 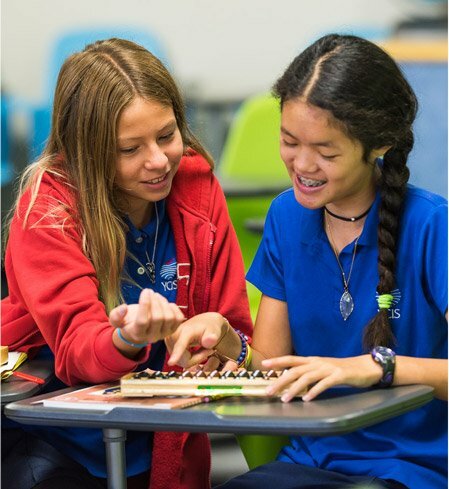 At the heart of a YCIS education is a globally-focused Mandarin and English dual language curriculum that shapes both hearts and minds. From the youngest preschoolers to our soon-to-be graduates, students grow creatively through the arts and music, develop leadership skills and service, and explore beyond the classroom as they grow into confident, articulate and compassionate individuals. We invite you to explore our Preschool, Elementary and Middle School programs. The preschool program is a fully bilingual, dual-immersion learning environment. 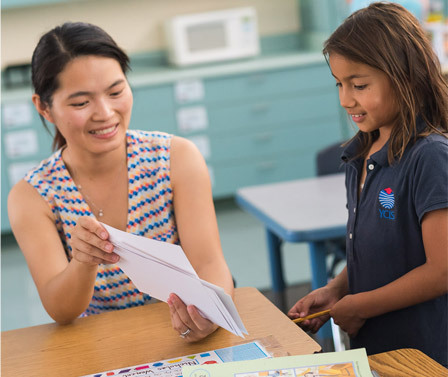 Native-speaking Mandarin and English co-teachers work together to support children’s learning through an inquiry-based approach. Taught in English: Mathematics, Science, Social Studies/Humanities, English Language Arts, Violin/Music and Physical Education (Grades K-8); Engineering, 21st Century Skills and Passion Project time (Grades 6-8). Taught in Mandarin: Chinese Language and Culture (about two hours per day in Kindergarten, 80 minutes per day Grades 1-8); Art for Grades K-8; Chinese History for Grade 8. Taught Bilingually with Co-Teachers: East Meets West project-based learning, Social-Emotional Learning and daily morning meetings. YCIS’s Chinese Studies program offers students the choice to learn either traditional or simplified characters. Chinese Immersion Summer Camp (ages 5 and up) is open to students of any school and all language levels. Campers explore creative, hands-on activities while building vocabulary, confidence in speaking, and cultural awareness through arts and crafts, drama, music, sports, science, cooking, building, language arts and more. Preschool Summer Session (4 year olds) – Pre-Kindergarten students are welcome to join YCIS preschool for a summer of play, exploration and creativity in two languages. Open to YCIS and other students. YCIS Silicon Valley is proud to be part of the YCIS family of international schools. Founded in 1932 by Madam Tsang Chor-hang in Hong Kong, Yew Chung has been inspiring young students to strive for academic and personal excellence for 85 years. Under the vision and direction of the founder’s daughter, Dr Betty Chan Po-king, Yew Chung International Schools grew from a pioneering early childhood program into a worldwide network of international schools. Today, YCIS schools serve thousands of nursery through secondary students in Hong Kong, mainland China and here in Silicon Valley. Established in 2002, YCIS Silicon Valley is an independently registered and operated 501(c)(3) non-profit school.